It may well come as a surprise to part-time slots fans that there’s an entire sub-genre of games centres around the Irish; to be a little more specific the subject is a fantasy view of the Emerald Isle where leprechauns dance around wells and there’a always a pot of gold at the end of the rainbow. A lack of subject matter means that these slots can be a little ‘samey’ but they’re all good fun nonetheless and should of course be enjoyed with a pint of Guinness or perhaps small Irish whiskey. 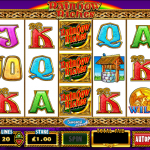 Rainbow Riches is from fruit machine designer Barcrest and we like it because it contains three separate bonus features to keep the interest. Since it's release this has proved to be a popular slot and it's easy to see why. Click here for the full review. 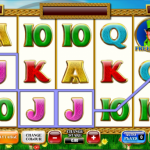 Leprechaun's Fortune is a relatively simple slot which stands out because of it's classy graphics which include a lovely vista of Irish countryside behind the reels. A lucrative free spins feature completes the attraction Click here for the full review. 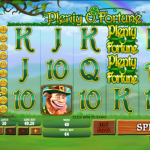 Plenty O'Fortune is Playtech's stab at an Irish-themed slot and it's not bad at all. It features those nice, simple Playtech graphics and an impressive three bonus features from which you can hopefully profit. Click here for the full review. 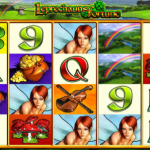 Leprechaun's Luck is from Ash Gaming and not only does it feature three bonus games, it also has a progressive jackpot for those who like a shot at the big bucks. Click here for the full review. 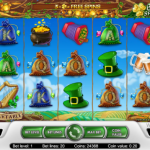 Golden Shamrock is probably our pick of the top five and the attention to detail in this Net Entertainment slot is noticeable. The animations on winning combos are the highlight but the whole game is enjoyable. Click here for the full review.